I started day 3 of gencon exploring the upper and outer ring of the convention center. 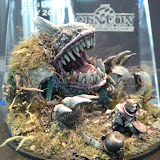 I found the miniature painting contest display and took a lot of pictures. Most are of poor quality since they are behind glass. I then visited the art exhibit which is in the center of the main hall. After trying unsuccessfully to get in a Catan Histories: Settlers of America Trails to Rails, I lucked out and got into Mansions of Madness. It wasn't what I expected. It wasn't a bad game, but the problem with Mansion of Madness is the same one I have with the D&D board games: it just feels like an RPG on rails. I would just rather be playing the RPG. Later that evening I played the new Shogun. The one that replaces dice rolling with the crazy tower you drop units into. It's a great improvement of the the original. Capped the night off with quick games of Space Hulk card game and Bang!. The later is a convention favorite we play every year. Day 4 is sort of a throw away day at gencon. I'll visit the hall and buy a few minor things a catch my flight. Spent most of my day touring the gaming hall, which contains most of the board, card, war, and miniature games. 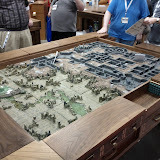 I saw a ton of outstanding terrain maps for miniature and war games. The rest of the time I spent first playing a demo of Chaos of the Old World and then playing it for reals in the gaming hall. It's a great game and will definitely buy it at some point. Later with my friends we played a the new space hulk card game. Pretty good at capturing the feel of the original space hulk, but I miss the miniatures. I capped the night off with some Arkham Horror. For once we saved the world and beat the game with just one turn before Cthulhu himself appeared. Follow my Google+ stream for real-time. Much easier for me to post my pics and info via Google+. So if you want to follow my in real time, do it there. I'll post a summary with photos later in the evening. I had a issues posting to blogger. It was much easier posting to G+. After a 2 hour wait for my badge, I spend most of the day walking around the exhibition hall and some of the gaming hall. I collected a few of the photos in a picasa web album. For the last decade, I've either been a GM or vendor. So getting my badge has been rather painless. As a standard attendee, I have to get it via will call. 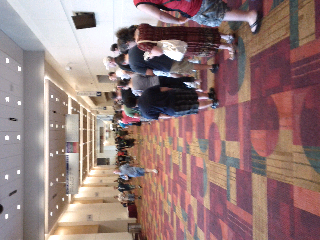 My god this line is the length of the convention hall! Why preregister? It would be faster to buy a new badge. Gencon logistics are as incompetent was ever. I had hope to write more blogs about the Indy years before leaving for GenCon 2011, but the convention came quicker than my writing. I'm off to catch my flight. 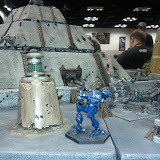 I may continue blogging about past GenCons after the convention or start up again as GenCon 2012 approaches. I'll post the major events here, but you can also follow me on Google+ or Twitter.